Time to eat collard greens! Sometimes you need to take a whole plant for a bigger “pot o’ greens.” To be the best kind of pot of greens, it would need to include a long-simmered ham hock, some onion, and the greens, and of course, hot sauce after it’s served. I like to throw some black eyes peas in that pot of greens too. But a few leaves can make a good side dish. One way to cook them is to simmer till the leaves are soft, maybe 15 minutes, then saute with some onion, and part of a can of tomatoes and green chilies. (I love Rotel brand.) Then grated Parmesan cheese on top to serve. 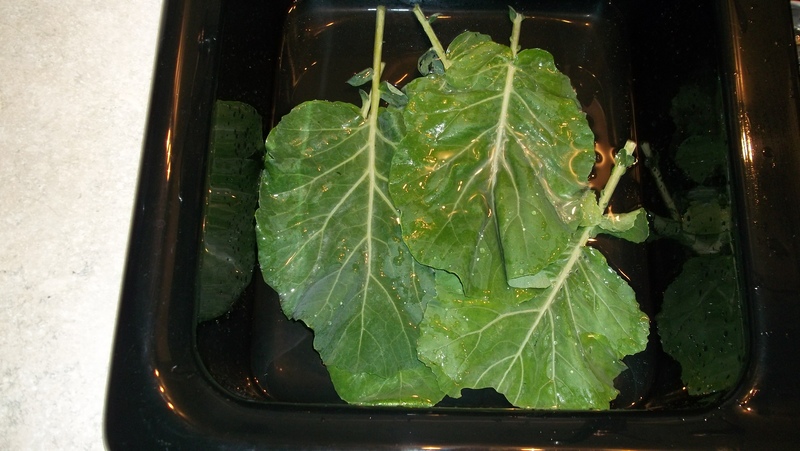 Hopefully everybody knows the basic rules of collards: the bigger stems are thick and nasty and should be discarded before you cook the greens. I just tear the leafy parts away from the stems. (Stems=compost of course.) Also, the underside of the leaves especially are likely to be very dirty from ground splash, and may have cabbage worms laying along the stems. 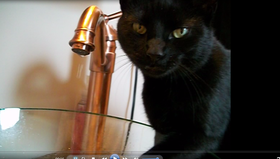 I like to soak the leaves in the sink in cold water for a while and then wash and look over each leaf carefully. No, it’s not too much work! Collards are very tasty greens and also have a lot of vitamins and calcium, they are inexpensive food (if you need to buy them) and also easy to grow, almost anywhere. You can grow yours better with aged horse manure as a fertilizer, the only fertilizer I’ll use, since it’s natural, harmless to the environment, and works well. But I also supply calcium to my collards and cabbage, right thru the ground. All winter I save egg shells, in an open plastic bag, in the garage, cos they will smell. I let them get good and dried out and then take a big bunch and pulverize them in a small food processor. Make it down to dust. Once thru the winter I’ll spread that on the ground where collards and cabbage will be planted. Then when I plant, I put some more around that whole area. Grow on, if you’re growing things, and best of luck and weather! I’m cookin’ up a dish of collards tonight with supper and I plan to try the black eyed peas and hot sauce in them. Are you SURE you’re not from the South? HaHa no, Sam I grew up 20 miles from right here. A lot of people up here miss these two good foods, and it’s sad cos they are good and good for ya. Do you grow black eyes? I love them fresh. I plant them inside my fenced garden and let them have the fence as their trellis. We can’t get them fresh around here unless we grow them our selves. Collards are available all year round in the stores, but the ones I grow in the summer are the best. Non GMO, no chemicals, mmm. I throw black eyes in with my collards all the time, but in the winter it has to be the dried peas you soak overnight. And of course none of that stuff would taste as good without a couple good shots of hot sauce. Do you ever put potatoes in with your collards too? I wish we were neighbors! Oh yeah, P.S. If you’ll soak those greens (and broccoli, cabbage, etc) in salted water it’ll drive out the worms, slugs and anything else alive in there. Well I just keep them in the sink and soak for a while and wash well, but I never heard of adding salt to get rid of….extra protein, lol. Thanks, I’ll start doing that! I never found time last week to cook black eyes and collards. Today might be the day…all I have is dried peas, I’ve never even grown them! Do I precook the dried peas before adding the collards and potatoes? I would assume since they take so much longer to cook I’d need to precook, but I defer to your experience. I soak the dried ones overnight unless I have more time to cook them the day I’m making the whatever I’m making. You might need to cook them several hours if you don’t presoak, cos they’re hard and it takes a lot to soften them up. You should grow some! I never had any fresh till I started growing them, cos nobody around here grows them. Fresh, I like to sautee them with onion, garlic, and a teeny bit of bacon. I know you guys don’t eat much meat, but it would be good without the bacon too. They taste entirely different when they’re fresh. The plants are more robust and get pretty big before they start to climb, but when they do, they produce a lot. I’ve been eating collards right along and it’s so nice to go pick some leaves and get them ready and have them fresh from right outside. Did I mention that I love the summer? I hope your supper is good!